Defects and deformities of the vertebral column can have a debilitating impact on the patient’s quality of life. Thirteen-year-old Jocelynn Taylor was no different. She was diagnosed with scoliosis, a condition characterized by an abnormally curved spine that may develop in children during one of their growth spurts. Jocelynn’s condition prevented her from being active in school and at home. Her vertebral column was also pushing her lungs and preventing her from breathing normally. Unlike most scoliosis patients, Jocelynn’s curvature extended past 100 degrees and required a complex surgery. Physicians at Children’s Hospital in Colorado took up the challenge under the supervision of Dr. Sumeet Garg. They worked closely with engineers at Mighty Oak Medical to create a specific three-dimensional (3D) model of Jocelynn’s spine. The model helped Dr. Garg with pre-surgical planning. He also practiced the surgery several times prior to the actual procedure and was prepared for any eventuality that could have crop up during the intervention. The surgeon also relied on additive printing technology to print customized brackets to straighten the vertebral column. Since the surgery, Jocelynn has been able to live life to without any restrictions and is immensely excited about the upcoming school year. Dr. Ralph Mobbs, a neurosurgeon at the Prince of Wales Hospital in Sydney, worked with an Australian medical device company to print an exact replica of a patient’s cervical spine and its underlying tumor. He used the model to understand the patient’s anatomy and practice the surgical intervention. In the past, doctors usually avoided such procedures as one small mistake could lead to permanent nerve damage and quadriplegia. The 3D model helped Dr. Mobbs successfully remove the patient’s tumor without impacting the surrounding nerves. Approximately 276,000 people across the United States are living with spinal cord injuries. An estimated 7 million people suffer from scoliosis. About 24,000 men and women have malignant tumors in their spinal cord. People also suffer from other spinal conditions such as spondylosis and intervertebral disc degeneration. Additive printing technology is influencing the way doctors approach these conditions and is helping improve patient outcomes significantly. Spinal tumors have also received a lot of attention in recent times. While their treatment often involves drastic measures, 3D printing is making it easier for patients to recover and rehabilitate quickly after the intervention. For example, surgeons in China had to remove a significant portion of a patient’s backbone along with the tumor to prevent the spread of his cancer. While the patient was able to beat the disease, he was unable to use his legs. 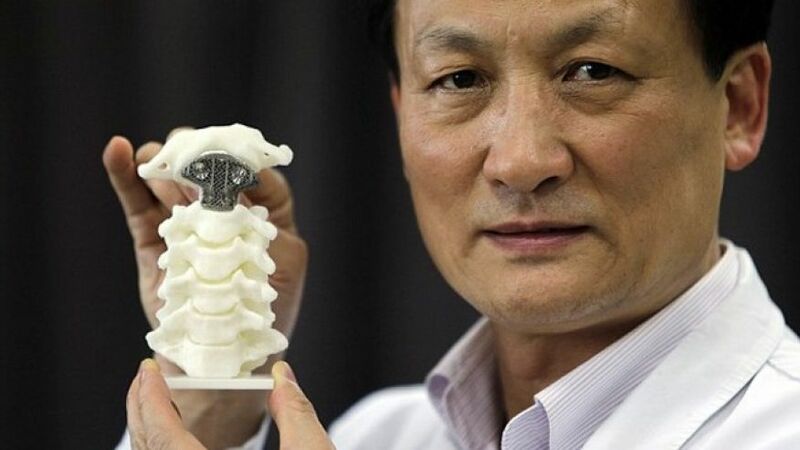 Orthopedic surgeons at Beijing’s Third University Hospital, under the supervision of Dr. Liu Zhongjun, 3D printed patient-specific spinal implants to replace five missing vertebrae. The 7.5-inch long titanium mesh constructs allow the patient’s own spinal cord to grow over time, and the implant will automatically biodegrade over time. Although some of these cases have received extensive media attention, they are not the only ones. Doctors across the globe are relying on 3D medical printing and bioprinting technologies to treat and manage many types of spinal conditions. In another important step forward,Oxford Performance Materials (OPM) received the Food and Drug Administration (FDA) approval for its spinal implant system designed to replace thoracolumbar vertebrae T10 to L1. The Connecticut-based company is now offering hope to thousands of patients with spinal trauma or cancer. The polymer construct met all the load-bearing and fatigue requirements of the FDA and is now available for patient use through specific distributors. OPM is working to expand its product line to include additional lumbar and cervical vertebrae. Other companies and research organizations are also looking for newer treatments that will help patients lead productive lives, in spite of their spinal problems. Collectively, these attempts will make 3D printing technology indispensable in the not-so-distant future.